Grandview Point, Grand Canyon National Park. 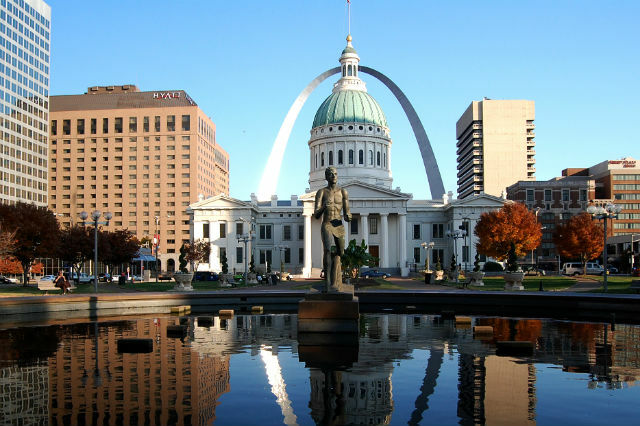 U.S. national parks showcase the country’s beautiful, yet diverse natural wonders. Where some people adore a wide open plain, others revel in the tranquility of high mountain peaks. Yet still others find beauty in Earth’s geothermal power. Here are seven of the U.S. national parks’ most scenic spots, with sites to suit any taste. This secluded valley holds a bounty of historic sites and verdant scenery. The 11-mile road loops through the area, past several restored buildings, including churches, log homes, barns, and a still-functioning mill – memories of the residents who settled here after the War of 1812. Plenty of parking can be found for exploring these sites as well as the trails in the area. This valley is home to a wide variety of wildlife, from deer, foxes, and elk to the occasional black bear, so keep your eyes open, particularly at dawn and dusk. Though it lacks the lush vegetation found in some other parks, Death Valley, which straddles eastern California and Nevada, highlights nature’s stark beauty. A particularly scenic spot is along the nine-mile-long Artist’s Drive. Here the monochromatic landscape gives way to the remnants of a violent geologic past. Oxidized iron, mica and manganese have painted the sides of this alluvial fan in stripes red, pink, yellow, green and purple, which greet visitors as they follow the one-way twisty road along the face of the Black Mountains. As the road dips and curves, views of the vast desert valley are juxtaposed against the array of color on the rock walls. The Artist’s Palette, located about halfway along the drive, is the prime spot for viewing this display. Though the view from the road is impressive, many guests stop to take a short hike to see the rocks’ hues up close. Unlike its tony namesake in New York City, Utah’s Park Avenue Trail, in Arches National Park, won’t empty your wallet…and the views are way more spectacular. This two-mile out-and-back trail among nature’s skyscrapers takes visitors up close to some of the park’s most well-known and frequently photographed sites, such as Courthouse Towers, Queen Nefertiti, the Three Gossips, the Organ, and the Tower of Babel. The hike itself is easy and relatively flat. Though these geologic features are visible from the road, experiencing them on foot provides the best sense of their immensity. Of course, Yellowstone National Park must be included in a list of the most scenic places in U.S. National Parks. The only question: Which spot in this well-loved park is the most beautiful? Based on its sheer burst of glorious color, a display of nature’s finest palette, the Grand Prismatic Spring is clearly the winner. This 370-foot-diameter hot spring in the Midway Geyser Basin is the largest of its kind in the country and the third largest in the world. But its size isn’t its main draw; the colors are the main attraction here. The bright blue center of the spring is ringed by bands of vivid reds, yellows and oranges. 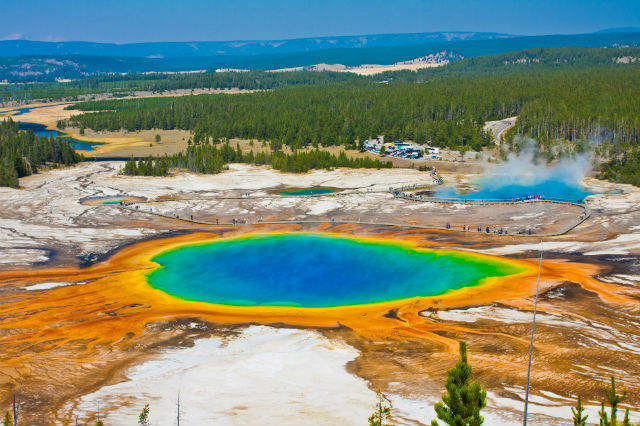 These rainbow rings are created by colorful thermophilic bacteria that dine on the minerals found in the water, thanks to the area’s high geothermal activity. Of course, because of its beauty, the spring is one of the most visited sites in the park, so arrive early to avoid the larger afternoon crowds. The best views can be found from the nearby Fairy Falls overlook. Sunrise atop Cadillac Mountain in Acadia National Park is a view to remember. As the first rays of light break over the eastern horizon of the Atlantic, the numerous islands off the coast of Mount Desert make their first appearance. Between early October and early March, visitors to this 1,533-foot vantage point – the highest point on the North Atlantic seaboard – are the first to experience sunrise in the United States. During the day, a panorama of Frenchman Bay, the Atlantic Ocean and the rocky Maine coast is easily accessible from the paved park road that leads to the mountain summit, but more adventurous travelers can hike the North or South Ridge Trails to the top of Cadillac Mountain. The sweeping views of the Grand Canyon are memorable and spectacular from pretty much anywhere in the park. 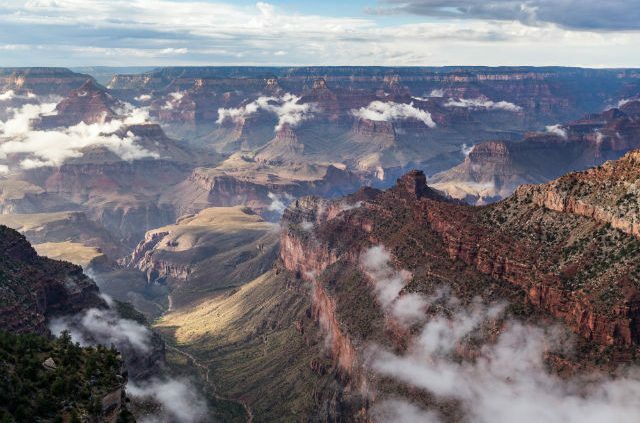 However, Grandview Point, which sits on the southernmost part of the canyon’s south rim, definitely offers a must-see vantage point. From 7,400 feet, it provides a sweeping overlook of several buttes, including Rama, Krishna and Vishnu Shrines, as well as the Colorado River far below. The Grandview Trail, which is found at the point, is one of the park’s easier descents, though it does not descend all the way to the river. This region receives more rain than other parts of the canyon, so it supports thicker forests of pine and oak. Access to the viewpoint can be found at the end of a one-mile side lane off the Desert View Scenic Road, about 12 miles east of the Grand Canyon Village. Though the mention of a scenic view usually brings to mind a vast, open landscape, the Big Room at Carlsbad National Park is an exception. This enormous 8.2-acre chamber is located a mile and a quarter down the cave system’s Natural Entrance Trail. Several features, such as the cave-popcorn-covered Lion’s Tail and the dangling Sword of Damocles – two well-known stalactites – as well as numerous fossils, side caverns and soaring stalagmites lend this underground treasure an otherworldly feel. Like many aboveground geologic features, this cave was transformed and created over millions of years. The dripping water carries minerals, which form the hanging stalactites and rising stalagmites, some of which eventually meet to form solid columns, such as the massive Temple of the Sun. Have you been to any of these places? Tell us in the comments!